Let me start off with a vent about my girl Emily Chavez. I absolutely love Emily Chavez: she's sweet, funny, kind, cute.... and pretty dang creative. 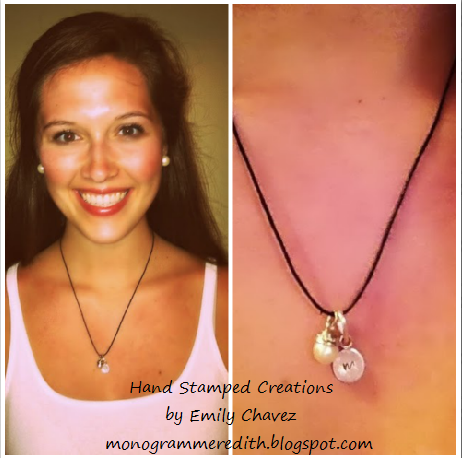 Emily has started selling her own hand-stamped creations and I'm in LOVE with them! Part of my project and love for young entrepreneurial activity is showcasing some of the awesome things that people my age are doing- these necklaces are one of these great things! But do you know what she's doing with the money? She's using it to pay for her mission trip to Haiti. I'm truly inspired by this girl's creativity and determination. What she's doing is creating a charm with whatever you want stamped on it- letter, name, word, etc. Then she'll add a bead of whatever color you want! You can decide between a black cord or a silver chain, as well. 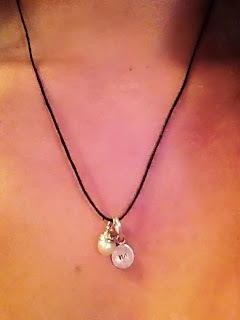 I chose an 'M', a pearl charm, and a black cord for mine. I honest to goodness can't stop wearing it, I'm just obsessed! What's even greater about these necklaces is that they're personal and cute, but they're also not expensive! How much better can it get? All proceeds go to Emily Chavez's Haiti fund! If you want one, e-mail her at emchav29@gmail.com, or even let me know (Comment below, fill out a contact form from the left side of this page, e-mail me, etc.)! I'm super pumped for Emily to get the chance to go to Haiti. I'm so so so happy about my necklace and I know that anyone who gets one will be as ecstatic about it as I am! PS: Do you sell something cool and want to be featured on my blog? Let me know!